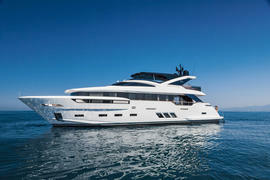 Italian yard DL Yachts has launched Akira, the fourth hull in the Dreamline 26 series at its Fano facility. This 26 metre semi-displacement yacht first hit the water last month. An all-GRP construction, she was styled inside and out by Team 4 Design, while naval architecture is courtesy of Arrabito. The layout on board Akira includes a main-deck master suite, VIP guest cabin, and two further guest cabins, as well as accommodation for a crew of three. Key features include a hydraulic tender garage and a spa pool on the upper deck. Power comes from a pair of 1,800hp MAN diesel engines for a top speed of 27 knots. At her cruising speed of 10 knots, Akira should be capable of a maximum cruising range of 1,200 nautical miles. This launch is the fifth hull that Dreamline Yachts has splashed since the range’s public debut at the 2014 Cannes Yachting Festival. Speaking in April, Paolo Bencivenni, CEO of Dreamline Yachts, said: “Many owners have realised the quality that we are able to offer. “Above all, they have appreciated the philosophy behind the whole Dreamline Yachts range, including the innovations that we have introduced both, from a stylistic point of view and from the technical." Other models in development at the yard’s Fano facility include the fifth hull in the Dreamline 26 series, as well as a recently ordered 30 metre yacht and a follow-up to the yard’s 34 metre flagship Maryliz, which is due to launch in Spring 2017.